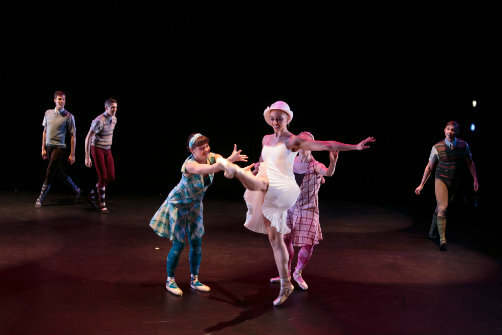 Bugge Ballet's The Chicken Went to Scotland in Jump on the DanceWagon 2015. Photo by Eric Bandiero. BOTTOM LINE: Six young female choreographers get vocal in this third season of Jump on the DanceWagon. Celebrating its third annual festival, Jump On the DanceWagon returned to the Ailey Citigroup Theatre with world premiere works by six up-and-coming female choreographers from Pennsylvania and the NYC area. Jump on the Dance Wagon was a show produced by a dance lover and educator, Ellen Stokes Shadle. There is something prize-worthy about producing a show of this length -- almost 2 hours -- with no state funding. The dancers apply and get accepted to show their work in the esteemed Joan Weill Center for Dance at the Alvin Ailey Center for American Dance. Nicole Buggé ‘s Buggé Ballet, Alexandra Pobiedzinski, Morgan Chambers and Jackie Kokolus of danceETHOS, Megan Mizanty of MizantyMoves Dance Works, and Jessie Tomanek of JT Lotus Dance Company were all a part of this production. Jessie Tomanek’s "What will you do to reach the top?" was well danced, but was disjointed as it is split between the first and second halves of the show and had lots of changing themes. The dancers seemed to fight conformity as they fearlessly leaped into Zachary Tracz's strong arms, but the rapid change from masks and suits to swimsuits was puzzling. The solo dancer had an unusual and interesting movement quality that I didn't see in any of the other dancers. As she turned to the back, she quickly turned to the front and her mask was a brilliant red. Morgan Chambers of danceETHOS piece "dystonic" was one of the most interesting duets of the program as the repetition of phrases gave this dance narrative. The dancers had good timing and weren’t overly dramatic with their facials as seen in other parts of the show which took away from the work. The red dresses and lighting was simple and elegant. Megan Mizanty Dance Work’s premiere of "Until we get Caught" was slapstick funny, but couldn’t decide what kind of mixed media production it wanted to be. The performers started singing, clicking their tongues, speaking and setting up scenarios while doing very little movement. Although I would have loved this to be in a more intimate cabaret setting, I did laugh out loud. "Vim" by Jackie Kokolus of danceETHOS was charged, but as all the moves predictably took a single count, it lost its intensity. It started off very well but Jackie could have pushed the idea even further. All of these young women have promise, including Nicole Bugge who closed the program. Nicole Buggé transports audiences to 1920s Scotland in her work "The Chicken Went To Scotland." Her piece had charismatic dancing by Quincie Hydock and cast, and it seemed as if the dancers really were genuinely overjoyed to be in it. What separates great shows from average shows are the finishing touches, and there were some moments that felt off in this production. From dancers not in their lights, to not everyone bowing together, to the piece split in half between the first and second halves of the program, these little things keep the show from shining as brightly as it could. Overall, I like what Shadle and the dancers are going for, but I hope they can look at the finer details to enhance the big picture.